A mega post today – a full dozen tracks for you to enjoy (if that’s the right word), many of them once again provide by long-time WWR contributor Ross Hamilton, and all of them in honour of George Harrison’s 68th birthday. Yes, I know that was on Friday, but indulge me. 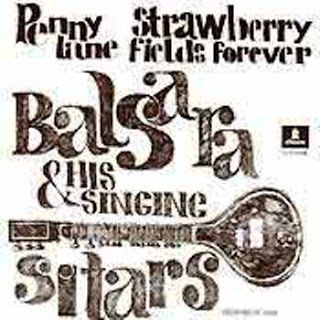 Norwegian Wood by the Folkswingers, a cut from the studio band’s 1967 album Raga Rock (which also featured awful versions of Hey Joe and Eight Miles High). Ross and I would both like to know how the cow got in on the act. Lucy in the Sky With Diamonds by William Shatner. If you haven’t heard this before where have you been? Strawberry Fields Forever by Balsara and his Singing Sitars, bizarrely originally released as a double a-side single with his version of Penny Lane on the flip. Anyway, have a great weekend, and I hope you enjoy. By the way, the next WWR post will be my 100th. I’ll have to dig out something VERY special for you! Greetings fellow bad music-ophiles, and welcome to the latest instalment of The World’s Worst Records. Next week I’ll be bringing you, courtesy of fellow bad music-lover Ross Hamilton, a whole raft of murderous Beatles-inspired monstrosities, but for today I would like to introduce you to one William Howard Arpaia, and his song-poem/vanity hybrid label Vandalia. William Howard Arpaia has a long and distinguished career outside of music, first as a US naval officer and later practicing law for four decades in Michigan and in New York. But here at WWR we love him for his singularly unique musical output, and for the many, many songs he composed in spite of having had no more than eight music lessons in his life. 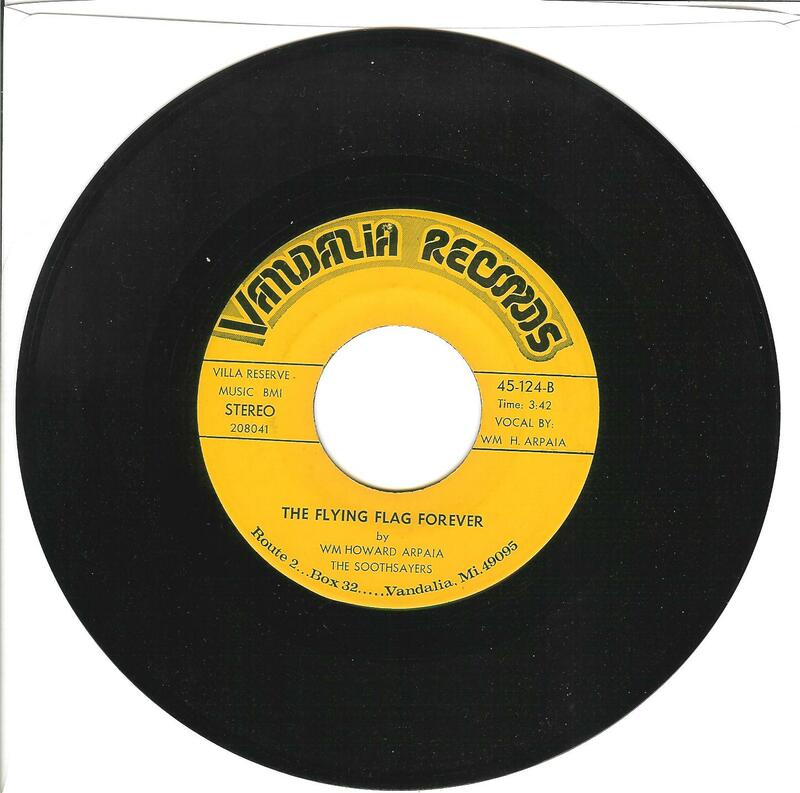 The Flying Flag Forever, written and recorded to mark America’s bicentennial in 1976, is just one of the 30 45s and five or more albums issued by Vandalia, all in all more than 100 songs all written by William Howard Arpaia, which were put out between 1974 and 1980. Not bad going for a man who admitted to composing his first song ‘purely as a lark’ on his 61st birthday in October 1969, but a mere drop in the proverbial ocean compared to the 2,500 or so he claimed to have composed by the time he issues his first album. Most (but not all) of the 45s contained a vocal track on the a-side and an instrumental (invariably a polka or a march) on the B-side: the Vandalia albums which are known to exist are split 50/50, with vocal tracks on side one and instrumentals on side two. Vandalia was named after the town in Michigan where William and his family resided; he had previously had compositions released by another song-poem outfit, Windy-City, before establishing his own company. It’s unusual, but not unheard of (as in Listen Mr Hat, which has appeared on a couple of song-poem compilations, including the essential American Song-Poem Anthology) to find William performing his own lyrics. Often he would enlist the help of one of the better-known song-poem outfits to bring his vision to life – which is why you’ll more likely see 45s on Vandalia credited to Sonny Marcell (aka Sammy Marshall), Rod Rivers (aka Rod Rogers, aka Rodd Keith, aka Cleveland Becker…), Lance Hill, Damita and so on than William himself. In fact The Flying Flag Forever and Listen Mr Hat are the only known vocal performances by the composer. It’s clear to me, listening to this, that William’s vocal performance was recorded at a later date and in a different ‘studio’ to the rather jolly background music. That, and his rather peculiar delivery, adds to the otherworldliness of the recording. This only arrived this morning, but it is so horrendous I just had to share it with you, my loyal partners in crime, as soon as I could. 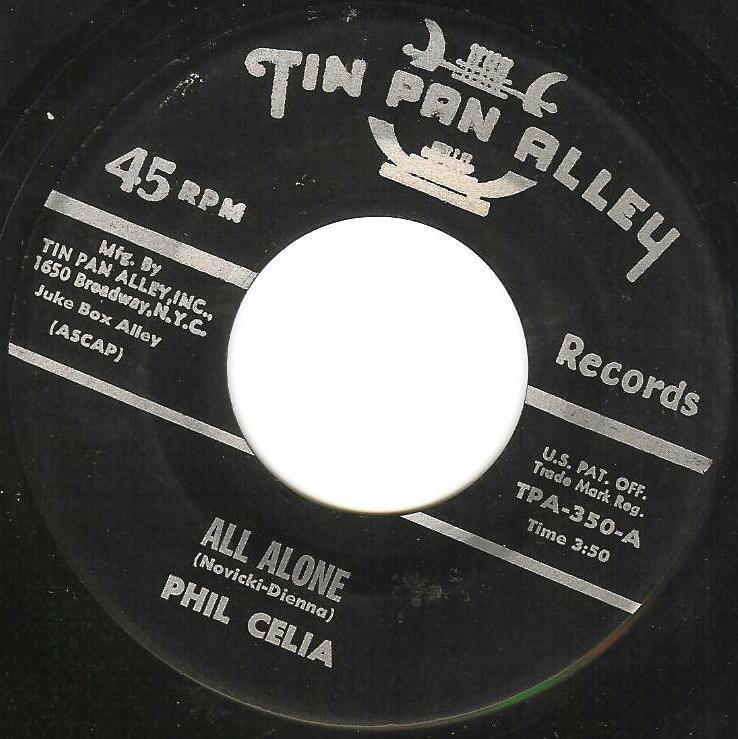 All Alone, performed here by Phil Celia, comes from one of my all-time favourite song-poem outfits, Tin Pan Alley. Busy since the early 50s, and gaining a bit of a reputation among doo-wop collectors for the quality of some of the company’s earliest output, Tin Pan Alley churned out hundreds of singles over the next three decades – so many that no-one has yet managed to pull together a complete discography: given the company’s confusing cataloguing system that’s hardly a surprise. Tin Pan Alley was founded, initially as a sheet music operation, in 1941 by Jack Covais a songwriter who, unable to hook up with an established publisher, wound up self-publishing instead. By 1943 he was already dabbling in song-poem publishing, and by 1953 Tin Pan Alley had become a full-blown song-poem operation - their first release came out on both 10” 78 and 7” 45 a year earlier, with both sides penned by Covais himself. It didn't seem to both the Brooklyn-based Covais that there was already an outfit called Tin Pan Alley, run by Frank Capano in Philadelphia, which issued its first recordings in 1946. For a full history of the company, go to Phil Milstein’s essential song poem website where you’ll also find a decent stab at a discography (although I have or know of several TPA releases which are unlisted there, including this one). Like many of the Tin Pan Alley releases this 45 must have been recorded in just one take and in one hell of a hurry. No attention has been paid to the finer details of the recording process: Phil is out of tune, the band come in late, the bassist is woefully inept (he must be the same useless bass player who plucks the terribly out-of-tune bass line on one of my other favourite TPA releases Who’s Going To Kiss You by “Lance”) and that accordion player clearly wishes he was somewhere else. And before you ask yes, it IS playing at the right speed. The b-side, included here for completeness’ sake, is almost as dreadful: Forward Into Peace is a dirge (and that’s putting it nicely) about an unnamed war, I’m guessing Vietnam considering the approximate release date of 1965, employing the same useless bass player but thankfully not the accordionist. Incidentally there is another Phil Celia still actively recording today. At least I assume it’s a different Phil Celia, as our hero began recording for Tin Pan Alley around 1956 – 55 years ago – and the jazz singer of the same name only turned 50 a few years ago. I wonder if it’s his dad though?